Roughly 60 percent of the world’s oil reserves and 41 percent of the world’s gas reserves belong to Middle Eastern countries. 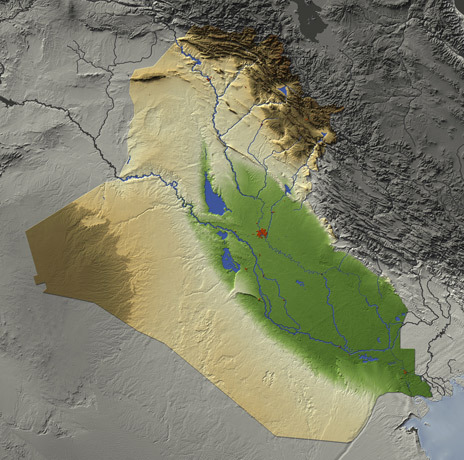 Some of that - actually, quite a bit - rests in the Iraqi subsurface. According to the BP Statistical Review of World Energy (2009), Iraq’s estimated oil reserves are now 115Bb, only surpassed by Saudi Arabia and Iran on a world-wide basis. Others present figures that are even higher. The result is the same. By making these barrels available to the world, as is now being done by Baghdad officials, production may soar from 2.5MMbopd today to 6MMbopd in 2017. That, at least, is the ambitious government target. When Iraq was invaded in the spring of 2003, many believed that the war “was merely a grab by Western companies for Iraq’s vast oil reserves” (TIME, December 7, 2009). If so, they have certainly succeeded in their efforts. Following two licensing rounds last year, altogether ten contract areas have been awarded. And, if the companies succeed in their efforts, production may eventually reach the official target, or even more. In fact, the projected increase will boost global output and may eventually bring down oil prices. The bad news is that the war-torn country has lost most of its infrastructure. What was there when production peaked at 3.7MMbopd in 1979 is now largely gone. Their almost insurmountable problems also include brain drain, meaning that there will be a critical shortage of geologists, geophysicists, engineers and managers. Unlike their neighbours Saudi Arabia, Kuwait and Iran, experts need to be imported into the country in order to achieve the goals. Thanks to Saddam Hussein’s behaviour, the timely invasion of Iraq seven years ago and the new government’s need for technical and financial investments, the huge deposits of oil and gas in Iraq are now again available to assist international oil companies to book new reserves. Distributed to more than 60 countries; online readers in 183 countries - GEO ExPro has become a global magazine in just ten years. Frack Off! But Where To? Only someone who has spent the last five years in the remote Amazon rainforest could be unaware of the influence of unconventional hydrocarbon resources on the economy of the United States.